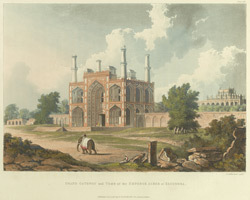 This is plate 23 from Charles Ramus Forrest's 'A Picturesque tour along the rivers Ganges and Jumna, in India'. Forrest was an East India Company official who made excursions along the rivers, producing drawings "attentively copied from nature, and in many instances coloured on the spot, ... while the magic effects of the scenes represented were still impressed on [his] mental vision". Forrest was part of the British force sent to negotiate with Maharaja Ranjeet Singh of Punjab in the early part of the 19th century. On their way, the force stopped at Delhi. Accompanied by an officer on a tour of several monuments, Forrest visited the mausoleum of 16th-century Punjabi ruler Akbar at Sikandra. Partially built in red sandstone and marble and situated in a garden surrounded by a walled enclosure, the tomb was completed by Jehangir in 1605. The main gateway leading to the tomb of the emperor is a splendid Mughal monument of red sandstone with inlaid relief patterns and four elegant marble minarets.